Excerpts from the Press Dossier : "... Among several other possibilities, most of the earlier North Pole expeditions have been started towards the pole either from Canadian side (Ellesmere Land) or Russian side (Cape Arktichesky). As much as known for us, no one has ever been skied nor paddled from North Pole to Spitsbergen without dogs and resupplies.Our goal is to take one consideration from this two men epic journey, well known in polar history – the plan what never became completed – we will try to return from North Pole back to the civilization in Spitsbergen.After being air dropped at the geographical North Pole, we will face to south and have to get back home. We expect to make it to the first land within two months. After what the journey will be continued about 400 kilometers more to the south until Longyearbyen (the biggest settlement of Svalbard). Depot has been put out on the coast of Nordaustlandet by the help of Dutch two masts sailing vessel Noordelicht. We prepare totally for about 1400 kilometers, but ice drift and weather conditions can unpredictably change it. 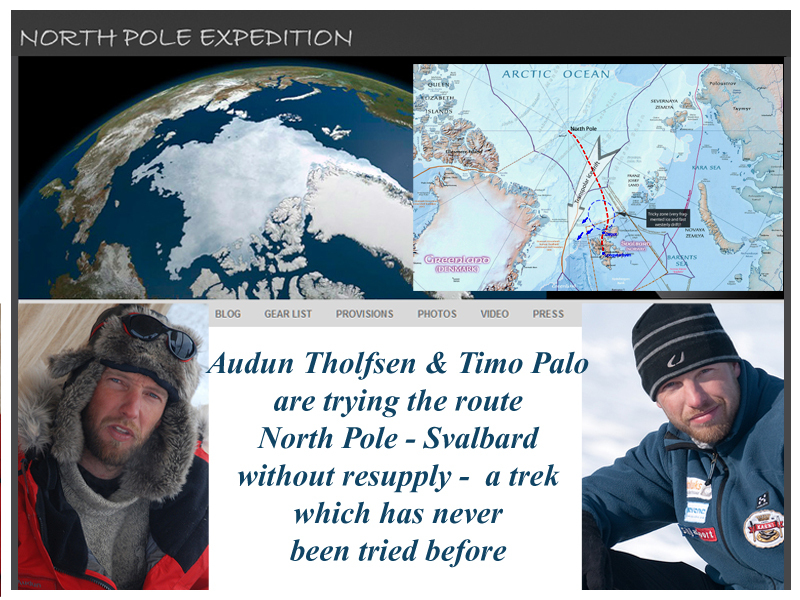 ..."
Both adventurers -although they do not have a very long experience of polar travels- are well aware of the dangerous challenges they will be obliged to face to ; ice conditions first, together wtiht the icepack drift. Second is the West Spitsbergen current ; it runs poleward along the west coast of Spitsbergen and drives warm and salty Atlantic Water into the interior Arctic. Third, the fact that the two will travel permanently on a moving terrain, the most unstable surface on earth. From the Press Dossier : " When one immersed into icy water, there is not much time before hypothermia takes all your strength. Winds and currents drive ice floes apart, creating therefore leads of open water, which can be sometimes huge - kilometers of wide. ... "
They wil also meet probably a lot of polar bears, a great potential danger, when traveling in the Arctic. Sea ice is their home and they might wandering everywhere around there. Though, usually they show up closer to the land. Several bear deterrents will be used to keep ourselves safe. No need to mention the weather, characterised up there by its unpredictability. Even when temperatures won’t be so low in this time of the year, the wind and poor visibility can still affect our advancement. When moving on the sea ice, visibility becomes very important to watch ahead and plan your route. Etc, etc. This spring arctic season, we ask our readers to follow the various arctic expeditions on their original websites.